Innotribe is SWIFT’s initiative to foster collaborative innovation in financial services – through debating the options (at Innotribe events) and supporting the creation of innovative new solutions (through incubation). Now in its third year, Innotribe at Sibos, Innotribe’s flagship event, runs throughout Sibos week and offers a comprehensive programme exploring a range of topics crucial to the financial industry. Innotribe at Sibos in Toronto will once again bring together a powerful combination of world experts to participate in an exciting mix of keynote sessions, case studies, and interactive discussions. Some aspects of Innotribe at Sibos in Toronto will be familiar to those who’ve attended before – for example, we are keeping the Innotribe Labs and the magic they create. 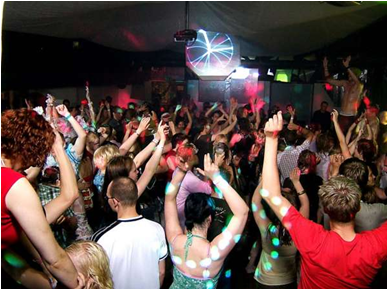 But we will also explore new formats and new topics. We will experiment with new facilitation techniques such as game-storming and open space discussions. We will build on our history of creating compelling line-ups of exciting speakers to bring together a set of our most exciting innovators yet to participate. 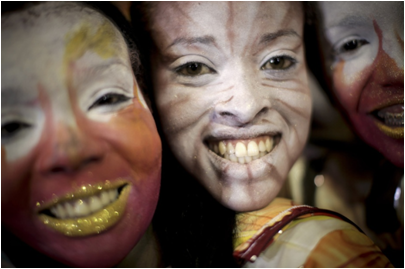 We will close the event with the Innotribe Celebration – our most ambitious interactive experience yet. In many sessions we will engage with students from the Social Data Lab from Stanford University and with young entrepreneurs bringing to the table the energy of Silicon Valley. And Chris Skinner will have a very special role: besides blogging, interviewing and tweeting he will also be our professional challenger to keep you and our speakers sharp. 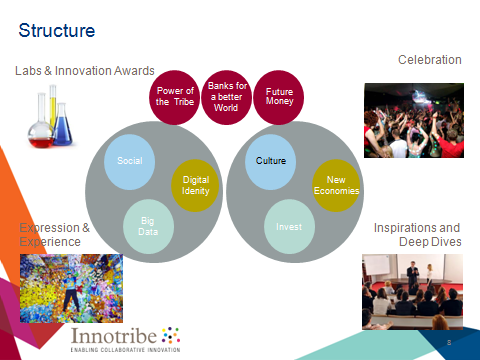 This year’s Innotribe technology inspired topics are Social Data and Collaboration, Big Data, and Digital Identity. And for the first time, Innotribe will explore non-technology topics – corporate culture, new economies, and a Start-Up competition . 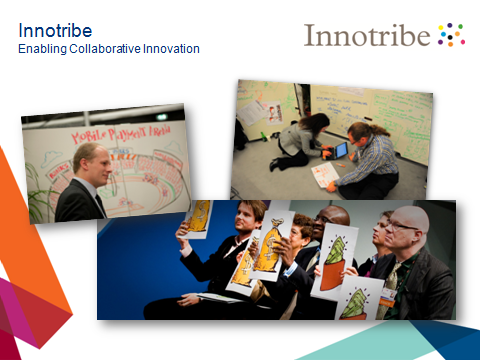 Innotribe at Sibos is open to all who come to Toronto. It brings together strategists, business and technology leaders, trend-setters and trend-watchers, thinkers interested in shaping the future and doers looking to implement it – in short, anyone keen to find out how the world is changing and what that means to our industry. In 2010, this session was standing room only. 2011 will be no different. 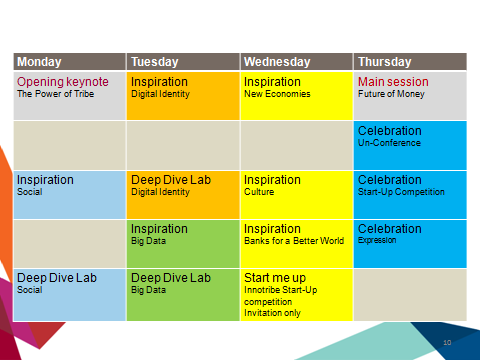 Through a couple of inspiring keynotes, spiced up with some novel interactive formats and techniques, we will introduce this year’s Innotribe topics. A session not to be missed! The quantity of data available to our businesses is sky-rocketing. Data volumes continue to explode, doubling every 14 months. So what tools are out there to enable us to use the patterns that can be identified in huge data sets such as Twitter, blogs, and other forms of social media to make correlations and even predict trends? Also get the lowdown on the SWIFT Index – a research project into how SWIFT traffic data can correlate with economic indicators such as GDP. And find out the latest on SWIFT’s Business Intelligence tools and how they can help you turn data into decisions. Facebook, Twitter, LinkedIn, Quora, Chatter and many other social data and collaboration platforms make it possible for banks to bring customer engagement to new levels of excellence. So far so familiar: but what is the bigger impact of social media on the banking business? What opportunities does this phenomenon enable for reputation and influence, talent discovery and development? And what is the best way to balance the opportunities with managing the inevitable compliance and regulation issues that social media create in the financial world? This interactive session will explore the edges of the digital identity eco-system, looking into personal data stores, trust frameworks, and multi-channel authentication techniques. We will also present the findings of the research phase of SWIFT’s Digital Identity Incubation project. We will explore how we can create true company culture change beyond powerpoint and processes. How do we allow for the human in our organisations, and show respect for the passion and vulnerability of the individual? How can you turn your company in to a talent factory? How can we create a community of change agents? Future of Money: is there still a role for banks ? This session will explore how Banks and Financial institutions can create a fund and a framework for supporting sustainable and responsible businesses. Together with several inspiring speakers we would like to engage you, the audience to create a vision of what Banks for a Better World may mean. We would like to engage in a conversation around the following topics: How can we create a new generation of wealth and value platforms and services to support sustainable and responsible business? Could we create a fund to invest in developing and supporting new organisations and business models that focus on delivering different value to society, such as “better banks”, ethical businesses, etc? Could today’s financial institutions play an active role in enabling new value transactions – exchanging social reputation for cash, money for social currency? The 2011 Innotribe $100K Start-up Challenge will introduce the most promising FinTech and Financial Services start-ups to SWIFT’s community of more than 9,700 banking organisations, securities institutions and corporate customers in 209 countries. On September 21, 2011 at Sibos in Toronto, 10 finalists, selected by their peers and expert judges, will present to an invitation-only audience of dozens of decision makers from the world’s largest financial institutions, serial entrepreneurs, investors and media. And on September 22nd, two of those companies will each be presented with a check for $50,000 in front Sibos’ audience of 8000 financial industry. Learn more. If your start-up is ready for the recognition and rewards it deserves from the global financial services industry, register and apply to the 2011 Innotribe $100K Start-up Challenge today! All the 2011 Innotribe themes will come together on the fourth day of the conference in an exciting non-stop “celebration” from 11am till 15:30pm – featuring open-space sessions, prototype and incubation booths, chatrooms, music, video and other animation, and of course the Award winners of our Start-Up Competition. The celebration will explore “the future of everything”. The buzz and excitement of this day at Sibos will set a new standard for interactivity in the conference space. change the world of banking. The future is here: are banks ready for it? The future of money: is there still a future for banks? Banks for a better world? A range of opportunities are available for sponsors wishing to effectively reach and influence potential clients in this targeted publication. Innotribe at Sibos 2011 will rock! Make sure to bring your energy pills! to seeing you in Toronto!